New Yorkers, and especially Brooklynites, do not take their egg creams lightly, nor for granted. I grew up in the 50’s and 60’s when egg creams were made and served in a candy store or a shop with fountain service. Legend has it, egg creams were invented by a Brooklyn candy store owner in the late 19th Century. Egg creams do not have eggs in them or cream. They consist of chocolate or vanilla syrup, whole milk and seltzer water…that’s it. And it has to be made to order. Some companies have tried to bottle it and sell it around the country. Absolutely the worst thing I ever tasted. No, egg creams have to be made at a soda fountain, or at home with the proper ingredients. When I was in high school I worked at one of those candy stores in Brooklyn that had fountain service, BonBons on 77 Street and New Utrecht Avenue. I must have made a thousand egg creams, along with chocolate sodas, vanilla sodas, cherry cokes, ice cream sodas, ice cream sundaes, malts and shakes. So you are not getting this insight from some novice. I’m a professional. Some might call me a jerk… a soda jerk. The technique of making egg creams was not written in some book. Or learned in a classroom. It was handed down from one soda jerk to the next. Eddie was my mentor. And he taught me everything I know about making fountain treats, and egg creams. I watched him do it a hundred times while I sat at his counter enjoying my own personal egg cream. I knew the formula by heart. Then one day, Eddie was called out of the store for a moment and the counter was unattended. A customer walked in. Just got off the B train coming from The City. It was a hot summer evening and the gentleman had his tie pulled down and his shirt collar unbuttoned at the neck. He had a Daily News under his arm and he looked like he needed a pick me up. Something refreshing. A treat and reward for his hour long commute from The City to Brooklyn. Some people crave a martini after a long day at work or before dinner. This gentleman wanted an egg cream…a chocolate egg cream. I didn’t waste any time. I jumped behind the counter and whipped up the tallest, coolest egg cream I knew how to make. The man dropped his 15 cents on the counter top as I placed the egg cream in front of him. The white, foamy head cascaded over the top of the glass and formed a pool at the bottom. He picked up the egg cream, wiped off the bottom, and holding the potion with his pinky raised towards the ceiling gulped it down in one smooth move. His head tilted back to be sure he had the last drop from the glass. He put the glass down and smacked his lips and thanked me for a good one. When Eddie got back to the candy store he saw me behind the counter and greeted the satisfied customer that was walking out of the store. I started working at BonBons the very next day. It was my first job after school. I was making $8 a week….off the books. Not only are the proper ingredients necessary for a proper egg cream, but the order which they enter the glass is also very important. Am I making too much of this? I don’t think so. You asked for a good egg cream, now I’m going to show you how it’s done. The Milk: You can only use whole milk. The non-fat or 1% or 2% will just not cut it. Save calories somewhere else. Not here. When egg creams were invented, milk was milk and no one was worried about how much milk fat was in the bottle. Whole milk helps make a proper head in the egg cream. You NEVER want an egg cream without the proper head. The Flavoring: Chocolate or Vanilla. Syrup of choice: Fox’s u-bet 20-oz. Vanilla Syrup Chocolate 22-oz. A Brooklyn original. Now here is a little tid bit that not too many people know. The time of year when you buy this syrup makes a difference. All year long Fox’s u-bet syrup is swettened with corn syrup…except during Passover. That is when they use 100% real cane sugar to sweeten the syrup. And that makes all the difference in the world to the taste of your egg cream. Is this too extreme? Not for egg cream lovers. You can’t use Hersey syrup or Nestle powder or bosco. So when Passover comes around it’s time to stock up on your Fox’s u-bet Chocolate Flavor Syrup. And how would you know it’s the right time to buy and your not getting the other stuff? At the top of the bottle is a shrink wrap plastic safety quality seal. And printed on that wrapper is the Kosher for Passover seal. Don’t buy it with out it. Fox’s u-bet also makes vanilla flavored syrup. Same deal. Buy it during Passover. The Soda Water: You can only use seltzer. Not club soda or San Pellegrino or Perrier. Club soda has salt in it and would ruin the taste of your egg cream. The other stuff is not seltzer…two cent plain….carbonated water. Only a fresh, cold bottle of plain unflavored seltzer will do. There was a time that you could not find seltzer in the stores. You had to buy the siphon bottles of seltzer. But thank goodness the market opened up for bottled seltzer water. Now it’s available everywhere. The Mixology: It’s always better to start with a chilled 15-24 ounce glass. (Libbey 15645, Duratuff Panel Tumbler Glass, 24 Ounce (15645LIB) Category: Iced Tea and Soda Glasses ) Pour about two fingers of whole milk in the glass. Simply curl your index and middle finger around the bottom of the glass and fill it with milk to the top of your index finger. Next, pour in the seltzer. A freshly opened bottle of ice cold seltzer. Fill the glass till the foam is about 1/2 inch from the top of the glass. Don’t worry if some runs over. Next, pour in about 2 fingers of your chocolate syrup. It will settle to the bottom of the glass and you can measure from there . Add a little more or less according to your taste, but for your first egg cream you can start with this amount. With a spoon, stir the egg cream with an up-down quick stirring motion till the syrup is distributed . Don’t stir too hard because you do not want to disturb the head that has formed at the top of the glass. The ingredients have to be placed in that order: milk, seltzer, and syrup. You now have the proper way to make a truly delicious New York Egg Cream. Enjoy! And stay thirsty my friend! This entry was posted in Drinks and tagged Brooklyn Egg Cream, egg cream, Fox's u-bet, New York egg cream. Bookmark the permalink. THANKS FOR THE HEADS UP ON THE FOX’S U BET DURING PASSOVER, I NEVER KNEW THIS, I JUST BOUGHT IT WHEN I NEEDED IT, I WILL BE SURE TO CHECK THIS OUT. I STILL MAKE MINE AT HOME WITH ‘VINTAGE’ BRAND SELTZER BUT MISS THE SIPHON BOTTLES THAT WE HAD DELIVERED BY THE CASE. WE CAN STILL GET A DECENT EGG CREAM AT KRISCH’S ICE CREAM PARLOR IN MASSAPEQUA THAT USED TO RESIDE IN BAY RIDGE. There’s still a company that makes the Siphon bottles at the border of queens and Long Island. I used to get my egg creams from Bon Bons…that gentlemen you served could have been my father. Thanks for this post, brought back great memories! Elena, if you got your egg creams from Bon Bons between 1968 and 1971 I might have made it for you! Back then Eddie and his father- in- law Vic owned Bon Bons. It was later sold to a neighborhood man that lived on my block, Sal Romeo. He brought food to Bon Bons and served lunch. I worked for him for a while as well, until we had a falling out. Thanks for your comments! There was also a chocolate syrup back then called Red Heart that I thought tasted better in egg creams than Fox’s. Thanks for the great memories!! This is a topic (egg creams) that is close to my heart as I was a soda jerk in Brooklyn at the age of 13 ½ to 19 years old. I observed and learned the art of making an egg cream from emigrant proprietors, Joe Wroblewski and Joe Steinberg, hence, the candy store Joe and Joe, and was located on the street level of 18th Avenue BMT – N Station ( between 63rd and 64st) Bensonhurst. Enough history and on to the egg cream. This was about 39 years ago, before mixology was relevant, and I never experimented with the order of syrup first, milk next and then seltzer. The additional variation (not mentioned by others), was that one of the Joe’s ? tweaked the carbon dioxide tanks which affected the egg cream’s effervescence. The other essential aspect of the egg cream was the process. This technique had to do with the use of a long stainless steel spoon that was positioned to hit the seltzer pouring in the glass and hitting the spoon at an angle that caused it to swirl. The seltzer and ingredients would swirl in a clockwise motion and you would be seeing that all important head emerge. The head at the top of the glass was so thick, that you would think we were using a whisk. I am still amazed at how many stories were shared with me from customers at the candy store (especially at the overnight shift) while drinking their egg cream. It was like a non-alcoholic bar. Last but not least; we had a jar on the counter of stick pretzels where the majority of egg cream drinkers sipped their egg cream with a pretzel. That’s my contribution to history. I am happy to say that all my kids have had the pleasure of my egg creams . Oh, I almost forgot. There were a few customers that predated the modern meaning of diversity and ordered a black and white – you got it; I would use half chocolate and half vanilla syrup. Enjoy! In 1971 the Village Voice ran a contest for best egg cream in NY. I worked at my aunts candy store after school. It was Libby’s candy store on McDonald Ave. and Church ave. We came in 2nd. Gem Spa on St Marks place and 2nd ave. in Manhattan came in first. I beg to differ on the placement of ingredients. First the Fox’s u-bet then the milk then u run the seltzer. Made thousands that way. Michael, the reason for the sequence of ingredients has to do with the quality of the “head” on the egg cream. I found the best head using my sequence. If you got a good head with your way, then that’s all that matters. Congrats on your second place win! I remember the clerk running the seltzer against the back of the spoon. Running the seltzer against the back of the spoon was a gentle way of adding the seltzer without creating all head. totally agree. u-bet syrup first. I agree Michael. I’ve made thousands of them…Fox’s first, milk “layered” on top of that then seltzer “layered” on top…. stir, drink and wipe the mustach off your mouth. Michael, I used to go to Libby’s for egg creams in the mid 60s/70s! They were the best! Awesome! I had Josie and Paul’s Fountain, right down my block, AND Hal and Buddies three blocks away, to get whatever I wanted. But in 1976, my Grandfather bought a luncheonette with a fountain counter, on 23rd avenue just below 65th st! I perfected my craft there, like you did in Bon Bon’s…You are spot-on about the sequence, but I must say that there WAS a superior syrup to Fox’s, which no longer exists, and that few may recall, called “Holly Brand” syrup. It was simply the best syrup we ever had around our way. Now, I still make egg creams, but instead of only using 2 cent plain, I learned another cool secret a while back…Use Fox’s U-Bet, and Vanilla Cream Soda to make a black and white! It’s heaven in a tall glass! I found fair-trade, all natural Fox’s U-Bet at Whole Foods. Sugar, no high fructose corn syrup. Tastes great. My husband had his vanilla egg cream every day. He wouldn’t settle for anything else. Thanks for the wonderful memories. He has since passed away and I can see him sitting at the counter with his egg cream and dunking his 2 cent pretzels. I guess my dad made them for himself in the wrong order. He used to do the chocolate syrup and the milk and mix then the seltzer. Hmm… I wonder how it would taste in the proper order. It tasted like a Yoohoo the way he made it. The order of ingredients makes the best “head” on the egg cream. Drinking the egg cream with the proper head is like having the proper head on a beer. It makes a difference. I agree with Peter. The Chocolate Egg cream with the ” white foamy head” is like having a cold beer in the glass with the foamy head quenching your thirst on a Hot day! It looks and tastes delicious! I made tens of thousands of Egg creams at Bon Bons from 1972-1982 utilizing Peter s mixture technique. I make my egg creams differently. I use freshly made seltzer from my soda stream seltzer maker. I start with the syrup and then about 4 ozs. whole milk and then half of the seltzer. Stir then taste. add more syrup if you need it. Top off with the rest of the seltzer and stir again. They come out great, and this stops it from running over the top. Never tried an egg cream. Your post has inspired me to try. I just have one question (really for my kids) Would it be drunk using a straw or from the glass directly? I want to make sure I do this right! Andrew, the proper way to drink an egg cream is straight from the glass. A proper egg cream has a “head” on it, like a beer. You would not drink a beer from a straw. Same concept. It’s not like you can’t drink it from a straw, I’ve seen plenty of people do that. But from the glass is the best way in my opinion. Enjoy! It seems Helayne that the ingredient sequence of an egg cream is as controversial as what us Italians call a pot of cooked tomatoes, sauce or gravy. And the debate continues. I have always made egg creams seltzer-last to obtain the brown, chocolate-y head. What I did not know is that the controversy appears to be a regional thing. I was born and raised in the Bronx, and according to the article linked below, syrup-last is a Brooklyn thing and seltzer-last is a Bronx thing. Who knew? Grew up in the Bronx during the early 50’s and couldn’t get by without our egg creams. If you ordered an egg cream, you automatically got chocolate syrup. If you wanted vanilla syrup you ordered a vanilla egg cream. At the drugstore down the block from where I lived, a vanilla egg cream was called a “dishwater” for short, because it looked like dishwater, clear and foamy. Him- What can I get you? Him: You want to drink dishwater? Me: No, it’s a vanilla egg cream. Me: It’s an egg cream, but with vanilla syrup. Him: We don’t have vanilla syrup. Me: OK just give me a chocolate egg cream. Him: What the hell is a chocolate egg cream? Me; It’s a chocolate soda with milk and seltzer. Him: What the hell is seltzer? Me: Seltzer is carbonated water. Him: i understand. You want a chocolate soda? OK. What kind of ice cream with that? Me: No!!! Not a chocolate ice cream soda, A CHOCOLATE SODA, but with milk!!!. Never-mind…give me a Coke. Grew up in Flatbush on East 34th St. & Glenwood Rd. We had many options for Premium Egg Creams and Lime Rickeys. At the Junction you could sit at the counter in the great Jentz or walk a few steps to Mama Shapiro’s Admiration Cigar newstand where her son Phil would greet you with “A nice chocolate egg cream sonny boy “. But my fovorite was Doc’s pharmacy on Albany & Glenwood. It was only at Doc’s where the tradition of getting scoops of Marshmellow spooned into your Egg Cream was available. It would be like 3 kids at the counter saying – Regular egg cream for me, I’ll have mine with a scoop, and the third guy says give me mine with 3 Scoops ! and the place goes WOW ! Never had an egg cream that way John. Sounds decadent! Wow! The old neighborhood! I lived on Glenwood Road….first house down from Doc’s. Had many an Egg Cream there, as well as across the street at Kennedy’s. I grew up on East 34th and Avenue J! Hello! Hung out in Jentz’s all the time, on the way home from school and Saturdays — Loved the place and the egg creams. Also had egg creams at Loebensteins on Avenue M.
I to grew up with egg creams from Doc. On your birthday you got a scoop of marshmallow free! Many candy stores in Brooklyn used Red Heart Syrup. It had a smoother taste than the UBet. My husband and I would buy a gallon from the candy store off of Nostrand Ave. and I think Ave. N. Haven’t seen Red Heart for year so we still use U-Bet but found if you add a little Vanilla UBet to the chocolate, it taste similar to the Red Heart. And Syrup last! It should float down through the white foamy head! I suggest Fox’s coffee syrup. Never had an egg cream with bottled seltzer that even came close to a fountain or old-style seltzer bottle egg cream. Bottled just can’t make the bubbles on top and the thorough carbonation that make a great egg cream…. Back in the day, the train that ran over New Utrecht Ave. was the West End, pre “B” line. This seems stirred too much — chocolate milk with seltzer:meh. 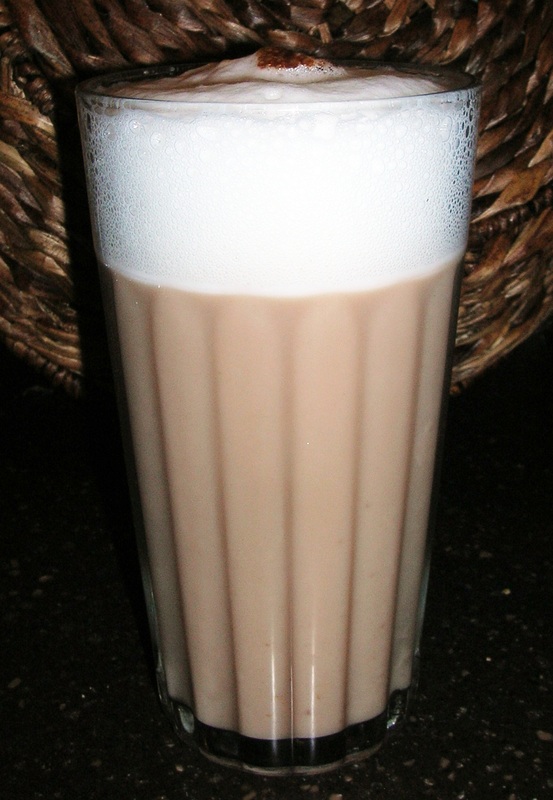 I recall the perfect “egg cream” was stirred only enough to leave a trail of chocolate through the seltzer and milk. It was the balance of ingredients and their states that made it so compelling. My friends and I usually bought our “egg-creams’,after school-(New Utrecht H.S. ),in the candy-store right by the stairs that led up to the change-booths,before going up,further, to the actual train-tracks….this was on the BMT line,on 79th St.,by NUHS….I don’t recall how they made those delicious drinks,but they were delicious,refreshing,and so popular with everyone!! (in the 1950’s)—who else remembers that candy-store? Arlein, you must be talking about Chookies. That was a famous hangout for New Utrecht High School Students. I used to hang out at Bon Bon’s on 77 Street and New Utrecht Ave. I remember both that candy-store and bon-bons. My grandfather owned the drugstore on the corner of 79th Street and New Utrecht. He then moved over to 77th and New Utrecht in the mid seventies. Louis, I remember that drug store, my mother used to go there. I moved to NYC in 1971 and lived on 3rd Street off Second Avenue. There was a fountain store on the southeast corner of Second and Third owned and run by an ancient guy there who claimed to have invented the egg cream, and made the first egg cream in the city. His beef was with the Gem Spa on St. Marks Place. The Gem Spa had a sign stating it was the home of the original egg cream. At the time I had not heard that Brooklyn claimed even earlier rights to being the original home, although I recollect 13th avenue and 72 street and having a few of them when I was 7 or 8. This old guy had his story down so firmly that there didn’t seem any room for dislodging it. He died within a year or two of my arrival, and the rich neighborhood history he possessed went with him. I recall that he had a young guy working for him who had gotten arrested for pot possession and was going to jail for a long time. Always wondered about that guy and how his life fared afterwards. Never had as good egg creams after that place closed down. Finally after reading all these Bklyn.egg creams, you have gotten it right. Seventh St. and 2nd Ave. was Louis Auster’s egg cream with the syrup which he made from the original recipe. I am his granddaughter Harriet Auster and my brother Stanley is well known for having the recipe still. We also had a store on Ave.D which was my father’s who was Louis’s son. Stan has been on many programs and on TV for years telling stories about our egg cream, the best tasting and the ORIGINAL. At the age of 10, 11 and 12 I served and was able to hold 3 glasses at the same time, first the syrup, then the seltzer (no separate milk), no Fox’s Ubet!!! Pure wonderful. Wish I could have some now but we used to make it in a huge, huge aluminum high-type pot. So now tell the 8th street store he’s a fake – just kidding they are not there anymore and neither are we. jWhen our Ave. D & 3rd St. store closed, my dad went to work in the 2nd ave. store. Uncle Mendy worked there also, his brother. That’s the true story of the egg cream!!! Harriet, If I understand you correctly, your grandfather’s egg cream was only made from his special recipe syrup and seltzer, no milk was added. He must have incorporated the dairy into the syrup. Interesting, I never heard this before. Wouldn’t it be wonderful if the recipe for his syrup was shared so we can bring back his amazing drink. It’s not doing anyone any good being hidden.That’s the purpose of my blog, to share family recipes so everyone can enjoy them. You know, making an Egg Cream with eggs and cream actually takes it back to its origins, and tastes amazing. My Hungarian immigrant grandparents occasionally did just that, when they wanted a more satisfying snack, a meal-replacement drink, as it was made in deluxe form in the Lower East Side when they first met and were married there in the 1930s. If you wanted a fancy, shmancy old fashioned egg cream, they made it with raw egg and cream! And, talk about a head! And flavor! And richness! An Egg Cream made with egg and cream is essentially liquid, sparkling ice-cream. When I really want to treat myself, that’s how I make an Egg Cream now, with a raw egg and some cream or half and half mixed in with the milk. Did anyone ever see this one?? On the Lower East Side of NY ,, there was a candy store on the corner of Delancey St. and Essex St. They had a seltzer dispenser unlike any other I have not seen to this day. It dispensed seltzer and chocolate syrup simultaneously. So ,all the jerk did was put some milk into a glass,,,then hit that black seltzer lever and out came the syrup and seltzer at the same time. It was a sight to see and the egg cream was awesome. This was circa 1960-62 or so. Nope, sorry, you start with the syrup, then the milk, then the seltzer. I, too, learned from a soda jerk. I grew up in the Bronx, drank many, many egg creams. I too remember it made syrup first, milk, seltzer…and the guy ran the seltzer over an upside down spoon to get a good head ! Wish I had one now! We had a seltzer delivery man once a week. U-bet all the way, Vanilla was my favorite flavored egg cream/vanilla soda. Boy, do I sure miss the old wooden crates and those awesome seltzer bottles. Can’t make a descent egg cream without those seltzer bottles. 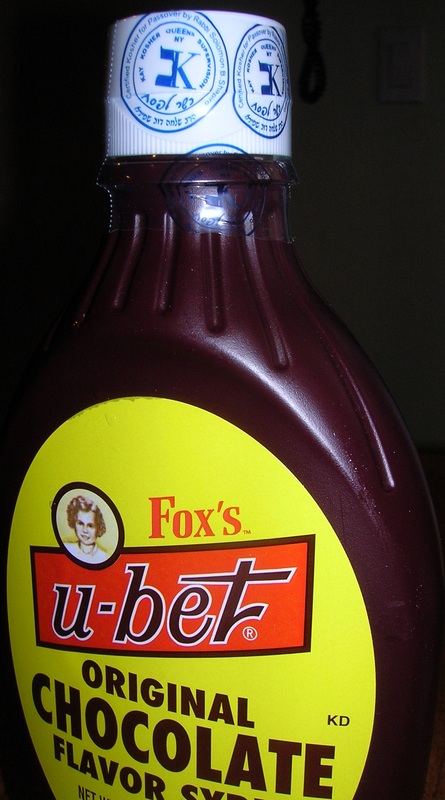 I remember my Mom buying Fox’s Ubet chocolate syrup. I lived on egg creams during the early 70’s I know live outside Nashville where they have never heard of an egg cream or carry the syrup. Can I have it shipped? Thanks Gene, ah, memories. Didn’t know it, Fox’s übet chocolate syrup to be made at Passover, but will look for it next time I shop. MEMORIES! I had a discount store called Discounts Galore around the corner from Bon Bon. Sal and Marie were good friends of me and my ex-wife. We had to move from that store because of termites and moved to 79th Street and New Utrecht Avenue. The old candy store called Fritag. Deborah, go to http://www.cookingitaliancomfortfood.com and if you scroll down on the right side you will see a button to press “sign me up” under Email Subscriptions. Well I am only 40 years old and I may not have the stories to tell about egg creams that you folks have. How ever I have one story that I can tell which probally match any one you folks might have. I know the place where I had my first egg creams it was at a bowling alley 18th avnue and 86th street in brooklyn called 3 star lanes back in the early 80s. This is where my mother met my step father and I thank God that she did cause he raised my brother and I since I was 6 like we were his own. He adopted us and told my mother he didn’t want to have any kids cause he never wanted me and my brother to feel we were loved any less. So I guess my egg Cream story has some deep sentimental value to me. But I remember sitting at the snack bar drinking egg creams and dipping pretzel rods in it and then racing up and down the back area from where the bowlers were sitting and playing the pinball machine with my step dad.. so if any of you bowled at 3 star lanes in the 80s in leagues you probally know my mom and dad they bowled in the Friday night mixed league if I remember correctly..
62nd Street was my stop on the B train, but my grandmother lived on Bay Ridge Parkway between New Utrecht and 16th Avenue. You could have served her, or my mother! I now live in Orange County NY and make my own Egg Creams. We had our Egg Creams at Joe’s Lunchenette up the block from Shallow Junior High School in Brooklyn. That’s the corner of 66th sit and 15th ave. joe’s father who was my Uncle Tony first made them He started with the syrup and a dollop of milk. The key to the foamy head was he had the fountain seltzer run off the long handled spoon into the glass which created a tornado of foam. They were there for 50 years until Joe retired in the mid 90’s. Just an FYI… the Egg Cream was created in the Bronx, and by Eastern European Jews. It spread to Manhattan, Brooklyn and Queens. This is something Fox’s and Marty Markowitz made up, pure historical revisionism! Yes, Fox’s U-Bet Syrup is from Brooklyn, but the actual Egg Cream was concocted in The Bronx. Michael, do you have a source to back up those claims? Because nothing I have seen has ever been conclusive. That’s the way they made it at Dave’s Luncheonette on B’way and Canal. The seltzer fell in a slow flow off the back of the spoon and they got a beautiful head on it! They also had a window on B’way dedicated to walk up EggCream customers! Sorely missed!! Love, love, eggcreams❤ Founding Fathers at Tyson’s has makes a good one! Great article – as well as comments! Isn’t it strange that even food memories can bring you back to a certain time and place! I never had enough money to enjoy egg creams often but did so enjoy them on those special occasions! Long Live Brooklyn and its many memories!! The best and how about Chookies on 79 n New Utrecht and Spanos on 81 n 15th Ave? How about Chookies on 79 n New Utrecht…Moms on 79 n 16th and Spanos on 81 n 15th. I used to go to Mom’s all the time for my Superman comic books and soda. I can still see her sitting in that lawn chair. Terrific article!! Thanks for the info on the syrup! I always knew that it HAD to be U-Bet’s, but the additional info is great! Being the daughter of a Jewish deli owner, I will give you an A+ for your recipe and technique for a wonderful egg cream. The only thing I have to tell you is that both seltzer and club soda are made without sodium or salt these days. Hubby can’t have salt, so I am a label reader and the brands we buy are sans-serif salt. Thanks for the memories. By the way, do you remember buying a hot chocolate at the corner candy stores? Always made to order, no packaged stuff and it was the best. Use to get my egg creams at the best place in the bronx. Jahn’s ice cream parlor. It was on Kingsbridge Rd. just before Kingsbridge Rd met Fordham Rd. The absolute best. I heard there’s one Jahn’s ice cream parlor left.It’s in Brooklyn. Went to that Jahn’s many times from Washington Heights. They gave a free sundae on your birthday. I seem to recall in the late 50s when the soda jerk was putting the seltzer in the glass he would reverse the leaver and push it forward so he would get a thin powerful stream to mix the syrup does anybody recall that trick. Yes , if you pushed the handle forward on the soda fountain it would give you a concentrated stream of seltzer. That was great for creating more head on the egg cream if it was too flat. Pulling the handle towards you gave you a normal flow of seltzer. Wasn’t the store on 79th street, where New Utrecht and 17th ave’s meet? I remember that candy store. It was across from Chookies. On a sort of triangle. It was a small store that used to get the late racing forms. I would pick up a “Chocolate Cow” from that store when Bon Bons was closed. Charlie Pells East 4th street and cortelyou Road was the place I had mine. I am still making it and I am in my 70s I just learned somthing today though. I didn’t realize when to buy the chocolate during passover holiday. I will remember to buy it this yr though. Have to see if they sell it in Florida where I now live. We were all so lucky to have been able to enjoy something so simple yet yrs and yrs later we are atill enjoying and taking about it, and sharing the proper way to make it. We are in Portland, Or. missing NY egg creams until we found Fox’s U-Bet Chocolate Syrup. We are introducing this delicious drink to friends and family. Does anyone remember the restaurant called “Triplets”. We had dinners and many celebrations. The food was Jewish style, Romaninan, chicken fat in mashed potatoes, skirt steak, chopped liver, pirogies. At the end of the meal, chocolate egg cream made by singing wait staff standing on a chair pouring each ingredient from 3 feet high into glasses!! What a show! Miss this and all the great food in the NY area. Helaine, I never heard of Triplets, but I wish I had. Sounds like quite the place. Singing waiters making egg cream flourishes….doesn’t get better than that! I always remember seeing it made by pouring ice cold milk in the glass first. Then the syrup. Then as the seltzer was squirted in the glass, it was stirred quickly until the foam hit the top. How is this especially a Brooklyn thing? What evidence do young have to think that it wasn’t popular in the other bouroughs? Linda, I can only speak from my experience living in Brooklyn. Obviously egg creams were more than just a Brooklyn thing. It was popular throughout the New York City area, including all 5 boroughs. I did the same thing at Silver Rods candy store and fountain in the corner of Rockaway and Hegeman Aves in Brownsville Brooklyn when I was a senior at Thomas Jefferson High School; circa 1958-59. That was my first ever job; making egg creams, cherry cokes, lime rickeys, etc. In Coney Island 1960s there was Bernards on the corner of Stillwell Ave And Neptune Ave. It was a Candy and comic book store. He made egg creams just as you describe. We would have him be creative too. He added Coke syrup and/or vanilla syrup to the chocolate egg cream. We called them Coke Creams. Also we just bought 4 of the Passover approved Ubet syrup. Robert, I remember red heart, Fox’s U Bet I believe was more a home brand. I have kept this secret for over 65 years only sharing it with my family. friends and neighbors….